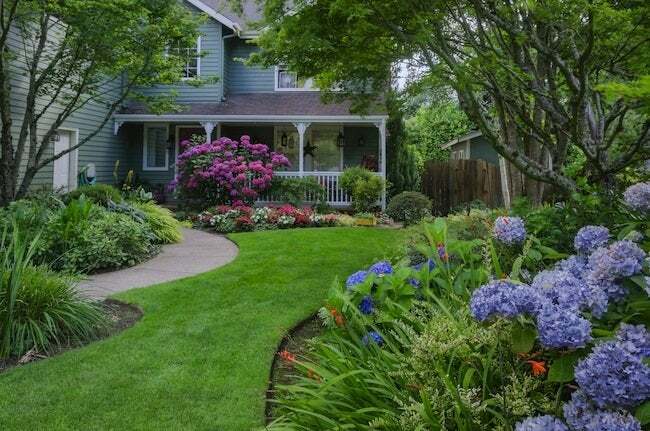 While there are no hard-and-fast rules for front yard landscaping, there are guidelines that professionals use to create their plans. These 12 tips from Certified Landscape Designer Dorian Winslow can help you achieve a professional look for your own yard. 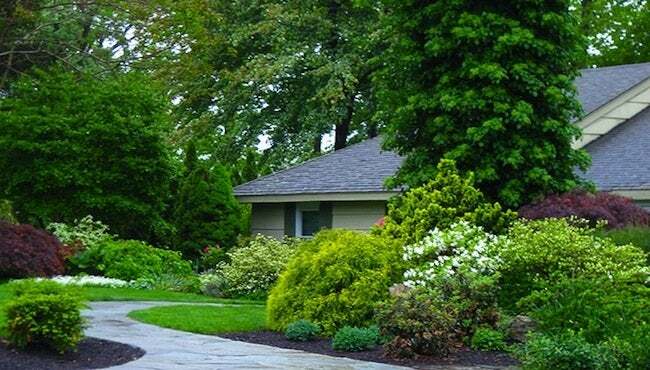 Your front yard, regardless of its size, plays an important role in your home’s overall curb appeal. Your landscaping, however, goes well beyond just a beautiful lawn. It should take into account the style and size of your house, how it’s sited on the property, the amount of sunlight the yard receives, and how best to enhance it with plantings, bushes, shrubs, and trees. It should also include hardscaping features, from walkways and driveways to raised beds, planters, and decorative containers. 1. Find your focus. Every view in your landscape should have a focal point. “For your front yard the focal point is the front door, so be sure you don’t hide it,” advises Winslow. If you are considering major plantings such as trees, think about how they will frame the front door as you approach your house. 2. Use ground covers. Ground covers are a low-maintenance alternative—and complement—to grass. “Because they’re low to the ground and dense, they give a neat appearance with very little maintenance,” says Winslow. “They also allow you to introduce spring bulbs to your landscape, because the ground cover hides the dead leaves after the bulbs bloom.” Be sure you research what ground covers work (culturally) with the trees in your yard. 4. Rethink foundation plants. “Avoid treating foundation plants as if they were little soldiers pressed up along the perimeter of your house,” advises Winslow. “For a two-story house, foundation plantings should extend at least eight feet out from the house.” And remember, a curved garden bed can soften the lines of your house in a pleasing way. Be sure the shrubs that are placed closest to your house are not taller than the windows, or they will block the light coming into your house and the view from inside looking out. When you’re planting shrubs, think about how they will look in three to five years. “You don’t want to select varieties that will block your windows,” she adds. 5. Add some privacy. If you are looking to add some privacy in your yard, consider a buffer of shrubs, suggests Winslow. “A buffer that includes multiple plants at varying heights can accomplish the same thing as a solid hedge or a fence but is far more welcoming,” says Winslow. Alternatively, if you are just trying to block the view from a particular room—or a part of your yard from your neighbors—plant a couple of trees or shrubs with strategic precision. 6. Deter the deer. If deer are an issue, select shrubs that are deciduous (lose their leaves in the winter) but retain their form even when their leaves are gone. This will help preserve the structure of your garden in all seasons. 7. Consider the light. “Your house is a large object that will block the sun for part of every day,” notes Winslow. If your house faces north, the front yard is never going to get great light. If it faces east or west, it may get searing sun for part of the day and then no sun for the remainder. Make your plant choices with that in mind, advises Winslow. 8. Think long term. If you’re planting trees in front of your house, plan 12 to 15 years out. They are considered a permanent fixture in the landscape, so you want to be sure they are not too close to the house. “If you are thinking of selling your house, a tree can be an asset—unless it is one that prospective owners think they will have to remove; then it’s a liability,” cautions Winslow. 9. Dress up the drive. 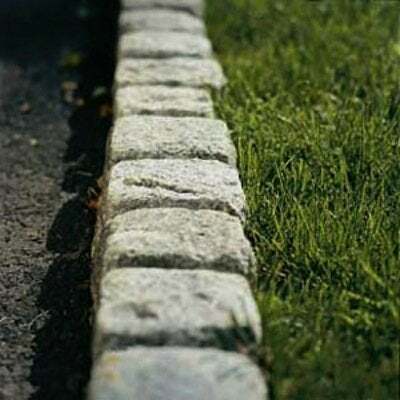 If you have a standard asphalt driveway that you want to enhance, install a border of Belgian blocks (more expensive) or cement pavers (less expensive) along the edges of your driveway. A border gives the driveway a more finished and “expensive” look. 10. Create an entrance. “If your driveway is a straight line from the street to the house,” says Winslow, “soften the line with a curved planting bed where the driveway meets the front corner of your yard.” This will create a pleasing sweeping effect as you approach the house. 11. Add a flowering tree. 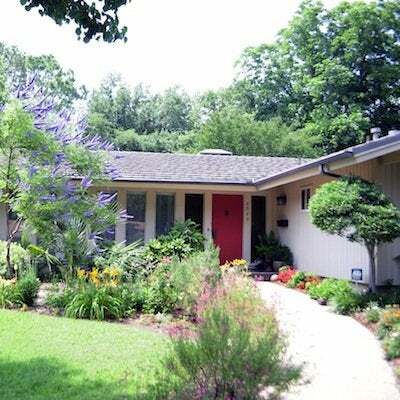 It provides wonderful curb appeal and is welcoming for those few weeks in spring when it’s in bloom. Flowering varieties provide fragrance and usually don’t block the house, because they tend to be smaller trees. 12. Keep it simple. Don’t crowd your front yard with lots of objects or plants. Have a clear structure to the design and a focal point.